At peak hours in the major cities, nothing moves. The traffic just sits, enveloped in a soft ectoplasmic blanket of its own fumes. It waits for someone to concede defeat, for the lights to change, for all the other cars and lorries and buses and bikes to miraculously teleport themselves out of the way so that drivers can continue their journey in majestic isolation. Since this doesn’t happen, everyone just remains stationary while the sun beats down and a thousand thousand air-conditioning units breath out their chemical halitosis. This passage made me put the book down and for a moment I tried to imagine the scene she was describing. It seems that just as the car is beginning to lose its cachet in the Western world, the Eastern world has become eager to taut their growing wealth by carrying on Henry Ford’s legacy. I met a young man in the UK from China, Jay, and I asked him about urban cycling in China. Jay, the son of two doctors, laughed at my question. “Those pictures you’ve seen of all the bicycles in Beijing? That’s just something of the past!” He said it in a way that made me wonder if he was trying to impress me. Like maybe he wanted me—the American—to know that most Chinese could afford cars now just like people in my country. He explained that taxes on cars in China usually exceed the cost of the car itself, but most of the people he knew were buying cars anyway. I told him I thought it was sad that the bicycles in Beijing were disappearing, and he seemed confused by my reaction. “Why are people giving up biking?” I asked. He told me that people get wet when it rains if they ride a bicycle to work. Jay and I sat next to each other on a train for about 45 minutes. He had three different cell phones to accommodate the three different calling plans he had—one for calling China, one for receiving calls from China, and one for calls in the UK. He gave me a bag of sour cream and onion potato chips and told me about his girlfriend in China. Jay also told me that he worked so much at his last job in Shanghai that he had to be hospitalized for a week due to exhaustion. He decided to go to graduate school after that experience. Here’s another Bathurst quote about new urban bike commuters that I like. The combination of physical risk and environmental smugness is a potent one, and when they first take up cycling many commuters go through a phase of almost radioactive self-righteousness. After all, if you feel you own the moral high ground and you’re doing something a little bit scary at the same time, then you might well reach the mystical god-like state called Always Being in the Right. Big mistake. After a couple of years, the best urban cyclists mellow, realize they didn’t personally invent cycling and get on with reaching their destination. The bad ones just keep arguing until someone breaks their jaw. Sure, it’s hard to stay calm when you feel threatened by a reckless driver, but I think the frame of mind you’re in when you get on a bike can really dictate a lot. If you’re looking for confrontation, you’ll find it. If you decide to be a conscientious and peaceful cyclist, chances are you’ll experience less drama on the road. It’s kind of like that quote about how the love you give is the love you get. The vibe you give off on your bike will usually be returned by other people on the road. Lastly, here’s a quote about stopping at red lights from Patrick Field who started the London School of Cycling and was interviewed for Bathurst’s book. How you treat a red light depends on how you’re feeling about both yourself and the rest of society. I tend to always stop at red lights. And the reason I like doing it is because I can show off that I can still have my feet on the pedals and my arms folded, and I’m a very vain old man, but I like doing it because I know I don’t have to. It’s like an ostentatious show, you know, I’m making a social contract with you people, I’ll follow these stupid rules, but if I do run a red light, I have to be in a hurry. The ones who make me laugh are…you know, I’m waiting at a red light, and these kids go past, desperate to move, as if their bike will explode if they stop. And then thirty seconds later, fat granddad overtakes them and I’m not even breathing heavy. The people who can’t stop at red lights aren’t happy—they don’t have the psychological resources to be themselves, so their infected with this anxiety, this “I’ve got to get going.” I’m not saying I’ve stopped at every red light even today, but it’s my default, to stop. I’ve been stopping at red lights a lot more since I read this quote just to prove to myself that I have adequate psychological resources. I also love this quote because at the end he admits to breaking his own rule. Why is it so hard to stop at red lights when you’re on a bike? Cyclists frequently blow through red lights even in Tokyo, home of some of the most law-abiding people in the world. More on Tokyo very soon. I’m giving a presentation at the University of Tokyo on Thursday and have some preparing to do! I had a jam-packed weekend full of sightseeing, biking, eating, and sleeping at very strange hours due to my jet-lag. 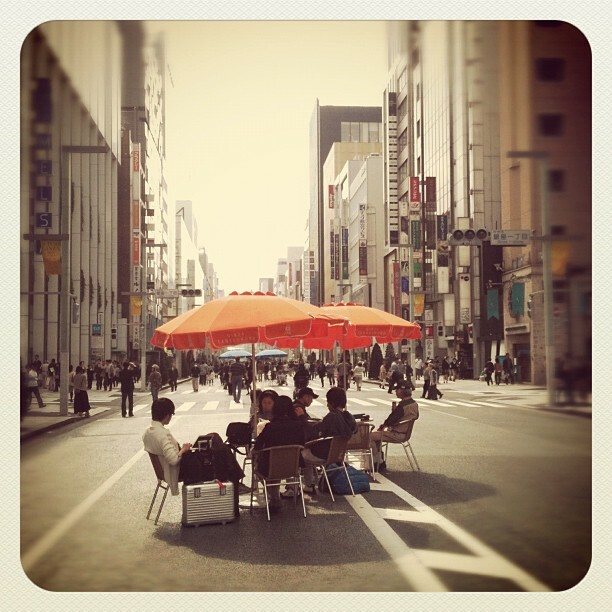 The Ginza shopping district turns into a pedestrian zone on the weekends. It was full of people shopping, relaxing, and socializing. Hi Christine, loved your last blog. Very thought provoking…again. Good luck on your presentation at the University of Tokyio. Good for you! Btw, Kevin and I are doing a brief jaunt through Scandinavia, having spent some beautiful days in Oslo and Stockholm and now heading to Copenhagen by train. I remember your first blogs from there and am very curious. Good luck!